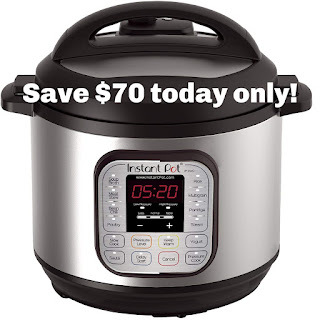 For today only, November 23rd, head over to Amazon where you can save big on this Instant Pot DUO80 8 Qt 7-in-1 Multi-Use Programmable Pressure Cooker - pay only $69.99 shipped (regularly $139.95)! It also features 14 Smart Programs - Soup, Meat/Stew, Bean/Chili, Poultry, Sauté/Simmer, Rice, Multigrain, Porridge, Steam, Slow Cook, Keep Warm, Yogurt, Manual, and Pressure Cook Now. For those of you that own an instant pot, what do you think of it? I have yet to get one. I recently replaced my slow cooker, so not in the market for another appliance but seeing that this pressure cooker has 7 in 1 uses makes me wish I had waited on the solo slow cooker purchase!